Harvey Dent is called the "white knight" of Gotham in the new movie Batman: Dark Knight. 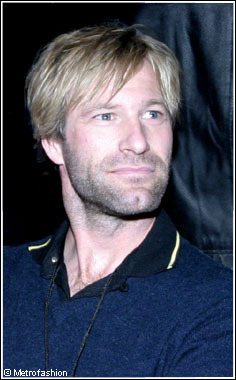 Dent is played by Aaron Eckhart, who always seems to end up looking good whether his character is or not. Aaron Eckhart promoted the film on shows like The Tonight Show saying he really is a surfer at heart and his persona on screen is just as cool. Never straying to far from the wide-eyed boy look, Harvey Dent is determined but often amazed as his own success, hesitating for just a moment as any of us would to take in the drama of cross-examing a mobster, or meeting a billionaire Bruce Wayne. Called a hero numerous times throughout the movie, Eckhart does a good job of never acting like one. The best heroes are the ones we feel are authentic, with ideals and actions first and bravado second. Eckhart has honed this role to perfection, with previous anti-hero characters in Thank You for Smoking and Paycheck. Now he gets to play a real one. Easy enough. As you can see from this Front Row shot from Fashion Week, Aaron Eckhart is the real Harvey Dent. The Fashion In Dark Knight, Harvey Dent is all business, with sharp tailored suits that fit his civil service role (Dent is the District Attorney of Gotham.) 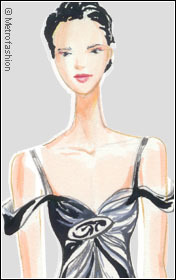 Rachel Dawes (played by Maggie Gyllenhaal), his assistant and love interest, confronts the villianous Joker in a long flowing midnight Hollywood evening gown.